Earle Bruce succeeded Woody Hayes as coach of the Ohio State University Buckeyes in 1979 and went on to compile an impressive, 81-26-1, record in his nine seasons as coach, including a 5-4 mark against rival Michigan. Bruce led the Buckeyes to two outright Big Ten titles (1979, 1984) and two co-championships (1981, 1986) and was named the 1979 Big Ten Coach of the Year after guiding the Buckeyes to an 11-0 regular season mark and a berth in the 1980 Rose Bowl. A one-point loss to USC kept him from an undefeated, national championship season in his first season. Somewhat unbelievably and remarkably, Bruce is still the last Ohio State coach to be named Big Ten Coach of the Year. Bruce also led Ohio State into eight bowl games, including two Rose Bowls (1980 and 1985), and he had a 5-3 bowl game record. Bruce then coached high school football in Ohio for 12 seasons, including 10 as a head coach. He suffered defeat just 12 times and guided Massillon High School to consecutive undefeated seasons in 1964 and 1965 before rejoining Hayes' staff at Ohio State in 1966. Bruce remained with the Buckeyes for five seasons, coaching the defensive backs his first year and the offensive line the next four seasons. Bruce landed his first collegiate head coaching job at the University of Tampa in 1972, where he fashioned a 10-2 record, including a win in the Tangerine Bowl. He then took over at Iowa State University for six seasons, where he guided the Cyclones to eight wins in each of his last three seasons. Following his tenure in Columbus, Bruce coached at the University of Northern Iowa in 1988 before taking over the Colorado State University program from 1989-92. He led the Rams to their best season in school history, a 9-4 record that included a win in the Freedom Bowl, which marked the school's first postseason appearance in 42 years. Numerous assistant coaches on Bruce's staffs went on to become head coaches, including Urban Meyer, Jim Tressel, Nick Saban, Mark Dantonio and Pete Carroll. 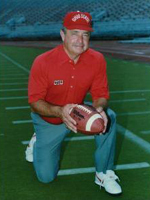 Bruce, who was 154-90-2 in 21 seasons as a collegiate coach, was inducted into the College Football Hall of Fame in 2002. His all-time coaching career spanned six decades and 45 years at the high school, collegiate and professional levels. He was inducted into Ohio State's Varsity O Hall of Fame in August of 2004.